More work has been undertaken in 2018 on the African Institute Reseach Project, after a great day of celebration in Colwyn Bay in November 2017, which saw a delegation from the DRC Embassy visit Colwyn Bay to reconsecrate the graves of the boys from the Congo who died there. This community research project started with the launch event for Black History Month in North Wales, which was held on Thursday 2nd October 2014 at Conwy Archives in Llandudno, Conwy. The event was entitled “Please do not forget to remember me” to celebrate the exceptional life and times of Rev. 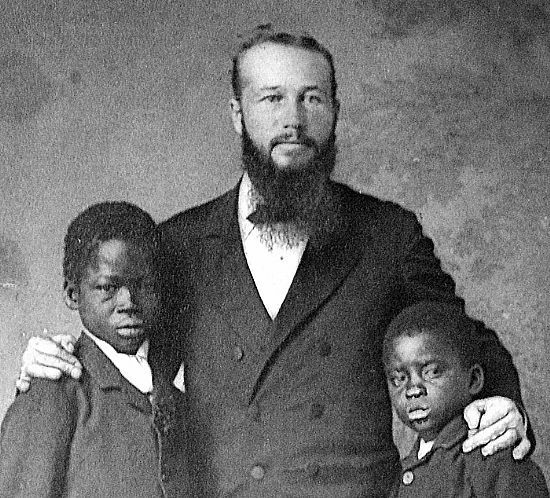 William Hughes, who successfully set up and ran Congo House and then the African Institute based in Colwyn Bay from 1885 to 1911 to train young and gifted Africans as Christian missionaries and also trained them with craft or medical skills to use when they returned to Africa. This story had been researched by local authors Christopher Draper and John Lawson Reay and published in their book “Scandal at Congo House”. This story is particularly significant in recognising the open minded, respectful and inclusive approach taken by Rev. William Hughes and the support given by the people of Colwyn Bay to their numerous African visitors, before a scandal was created to discredit and besmirch Hughes work and vision. An illustrated presentation was made by John Lawson Reay, who was thanked by Liz Millman from Race Council Cymru and Co-ordintor of Black History Month in North Wales. This was followed by recognition of National Poetry Day with a poetic presentation by visiting Jamaican poet and historian Yasus Afari, who is a founder of efforts to recognise Black History Month in North Wales. Yasus Afari also made an announcement about the exciting Wales / Jamaica Poetry Tour being planned for 2015 which will offer many opportunities to explore shared histories. After a break, Norbert X Mbu-Mputu, who is an exiled journalist from the Democratic Republic of Congo, now living in South Wales gave a lively and informative presentation to introduce his book “BAMONIMAMBO (The Witnesses): Rediscovering D.R. CONGO and BRITISH ISLES Common History”. This presentation also highlighted new information about the life and times of HM Stanley, which will be the focus of a future event and activities for the North Wales Black History Network. In October 2015 the Learning Links International team, with support from Colwyn Bay Library, managed to bring a group of local people together to read the book "Scandal at Congo House" and to research more about this incredible story to ensure that the valuable work of Rev William Hughes and the Africans he helped with support from the local communities of North Wales is not forgotten. This group met as the "African Institute Research Group" and put on an excellent display of their work at the CCE in Colwyn Bay on Friday 15th July 2015.